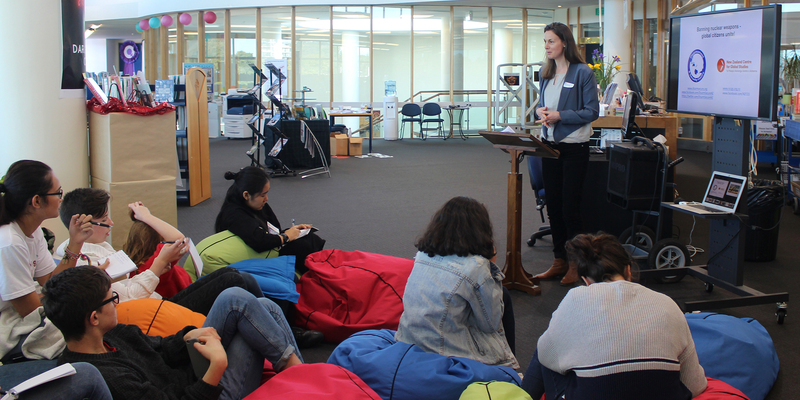 Lucy Stewart, Disarmament & Security Centre Coordinator, speaking to students about nuclear disarmament, as part of the Symposium on Disarmament and Climate Change at St Cuthbert’s College, Auckland. July 2018. Recognizing also the importance of peace and disarmament education in all its aspects and of raising awareness of the risks and consequences of nuclear weapons for current and future generations, and committed to the dissemination of the principles and norms of this Treaty,..
Education on disarmament and nonproliferation is one of the key ways that we can make change in the world. The next generation need to understand the global nuclear legacy that they are inheriting, the disarmament issues the planet faces, and also to be provided with the tools to continue working for positive progress. Disarmament education can take many different forms, address many different disarmament and non-proliferation issues and topics, and can be targeted at all ages of learners. A key document on the relevance of Disarmament Education and the forms it can take is the 2002 UN Study on Disarmament Education. “It is striking for someone of my generation to think that an entire new generation of human beings is coming to maturity without an ever present terror of nuclear catastrophe. Yet it is so, and that is for the better. The downside, however, is ignorance of the real dangers that do exist, especially the legacy of nuclear weapons inherited from the last century. Moreover, the companion of ignorance is complacency: what we know little about, we care little to do anything about… It is important to understand how the excessive manufacture, trade, procurement and stockpiling of weapons can exacerbate war and make it more lethal and dangerous, or how this affects health, destroys the environment or hinders development. Indeed, the more that is known about conflict the better." UN Study on Disarmament Education, the United Nations. 2002. Dr Kate Dewes seated front right. 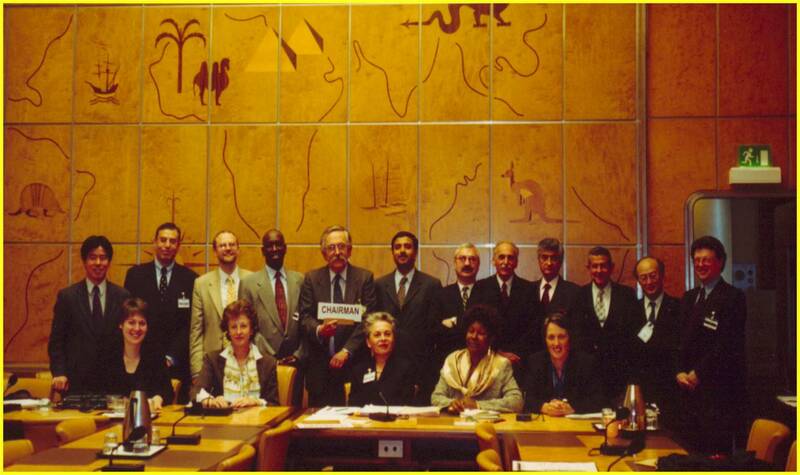 The 2002 UN Study on Disarmament and Non Proliferation Education was drafted for the UN Secretary General by a group of governmental experts from 10 countries including New Zealand. It builds upon and seeks to revitalize past efforts at disarmament education, which is an integral part of peace education. It tackles new elements such as the growth in the significance of non-proliferation of weapons of mass destruction and small arms, as well as gender perspectives on security issues. Its main contribution was the 34 recommendations for action to be undertaken by governments, regional organizations, the UN and other international organizations, municipal and religious leaders. It also seeks to establish close collaboration between the experts and civil society, including educators and academic institutions mainly at the secondary and tertiary levels of education. The Study encourages educators to use a variety of teaching methods, including participatory learning approaches. It advised those preparing educational material to be sensitive to various audiences, cultures, customs and situations and to find ways to present it in the language of the recipients: “In addition to computer-based learning, model United Nations programmes, other role-playing and simulation games, videos, electronic games, film, dance, song, theatre, puppetry, poetry, photography, origami, graphic art and creative writing are all useful methods.” It also promoted the development of UNESCO Cities for Peace. The United Nations Office on Disarmament Affairs (UNODA) has a large body of disarmament education resources, such as activities, films and publications. The Nuclear Threat Initiative also has a large body of disarmament education resources such as videos, publications and fact sheets on various weapons issues. The International Campaign Against Nuclear Weapons has produced a number of educational resources on nuclear weapons issues. Parliamentarians for Nuclear Non-Proliferation and Disarmament have produced a number of resources for Parliamentarians here. Learn about divestment from the nuclear industry in the Don’t Bank on the Bomb Report here and Move the Nuclear Weapons Money here. Hibakusha Stories passes the legacy of the atomic bombings of Hiroshima and Nagasaki to a new generation, and empowers them with tools to build a world free of nuclear weapons. Free online interactive documentary series Nuclear Dissent, detailing French Nuclear testing in the Pacific. ‍Tau Te Mauri: School Resource Booklet - classroom activities for use with the documentary film Tau Te Mauri - Breath of Peace, available from WickCandle Films. Nuclear Free Nation: Classroom Activities (PDF format), a set of discussion questions (and model answers) for use with the Nuclear Free Nation DVD. These deal with: New Zealand’s nuclear free law; nuclear weapons; the Rainbow Warrior bombing; the campaign to make New Zealand nuclear free; and the World Court Project, which sought to have nuclear weapons declared illegal. Produced by the Disarmament & Security Centre in 2007 (distributed to secondary schools nationwide). Nuclear Free Nation: Additional Reference Materials, for use with the Nuclear Free Nation educational CD/DVD package (distributed to secondary schools nationwide). Get in touch if you would like to book a presentation or workshop on disarmament at your school, community group or university. We’re also happy to provide information and advice on disarmament education activities that might suit your learners and examples of how it might fit into the New Zealand curriculum. See our various resources for further materials - click here for text resources, and here for digital resources such as films. 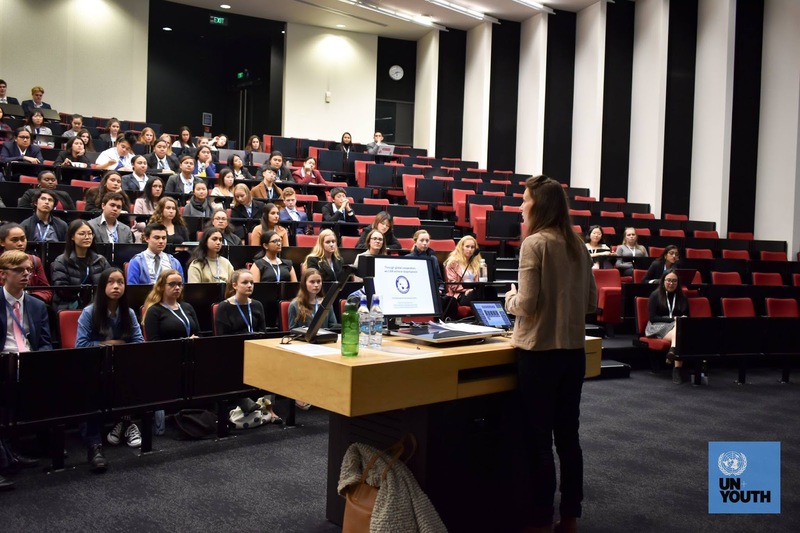 Lucy Stewart, Disarmament & Security Centre Coordinator, speaking at the UN Youth Model Asia Pacific Forum, Auckland. July 2018. University of Auckland, summer school, LAW PUBL 466 Contemporary Issues in Disarmament Law. Taught by Assoc. Professor Treasa Dunworth. The National Centre for Peace and Conflict Studies hosts options for Masters and PhD study in Peace and Conflict issues. PEAC 506 Peace Traditions of Aotearoa New Zealand and is being taught by Dr Heather Devere. The paper will include indigenous nonviolent resistance, restorative justice, the Waitangi Tribunal, Anti-War and Anti-Nuclear movements, peacekeeping and the Pacific, peace education, conflict prevention and conflict transformation. The Public Advisory Committee on Disarmament and Arms Control have funding available for tertiary study on disarmament and arms control issues through the Peace and Disarmament Education Trust. Please see link for further details.